The Mysterious Mitigation /Hawks Aloft Inc. 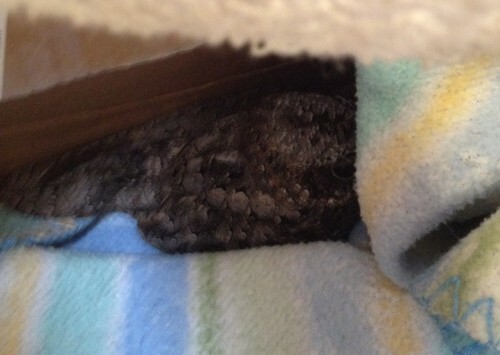 Rescuing injured birds of prey, or mitigations, can be a very interesting experience. 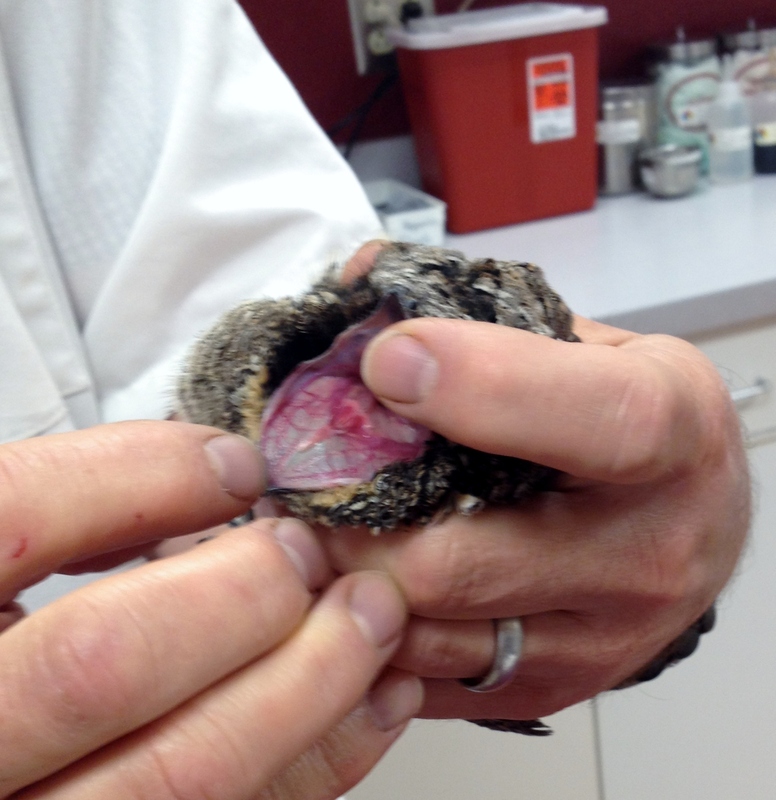 When we get a call about an injured bird, the caller is more often than not unsure of what exactly the bird is. So last week, when we got a call from a business in Bernalillo saying they had an injured “hawk-owl” that had “hissed” at them, I was guessing a small owl. When I arrived, they already had the bird in a box. I took a peek, to see if I could identify the bird, but it was hiding in the towel and I could only see its rump. Based on the coloration and size, I guessed Flamulated Owl. I thanked the folks who helped the bird and took it immediately to Dr Melloy at Coronado Pet Hospital in Bernalillo. Upon peeking in the box, his first guess was also Flamulated Owl. Once he pulled the bird out to examine it, however, we saw that it was something very different: a Whip-poor-will. Upon first glance, I assumed the bird was some kind of small owl. Whip-poor-wills are more frequently seen than heard. Their name comes from the sound of their call, which sounds like the words “whip poor will.” Probably the most astonishing feature of the Whip-poor-will is the size of its gape, however. Despite the deceptively small bill, their actual mouth is the entire width of their head. They use this phenomenal gape to catch flying insects on the wing. The Whip-poor-will has an tremendous gape which allows it to catch flying insects. 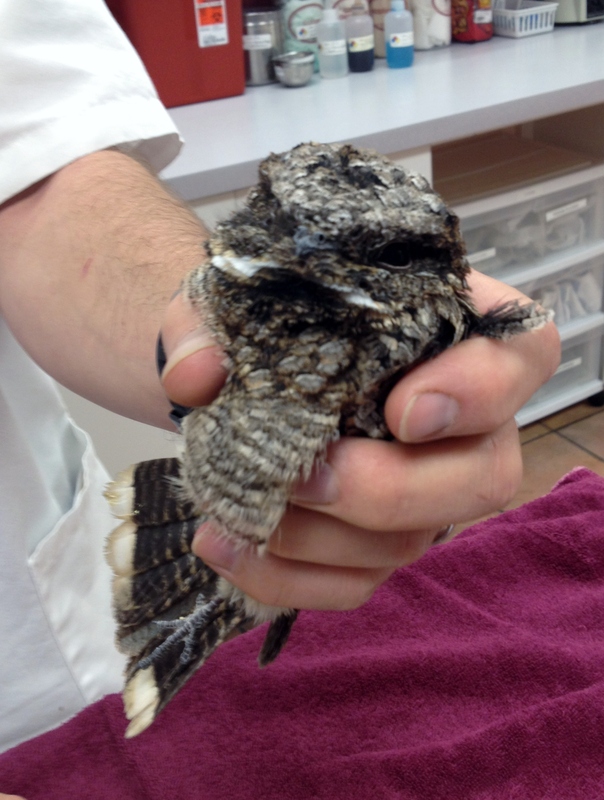 Dr. Melloy x-rayed the Whip-poor-will and discovered that it had a broken wing. He wrapped it and made me a copy of the x-ray. I transported the bird to the Nature Conservancy’s Wildlife Rescue and left it in their capable hands to rehab. It was definitely a mitigation to be remembered. Our “hawk-owl” turned out to be a Whip-poor-will.